Discovering Australia during the growing season of the sugarcane, unfortunately, none of the sugar mills were in operation; therefore, no tours were available. Luckily for us, the Sarina Sugar Shed has constructed an adorable boutique-sized sugar mill just for this purpose. Using their own micro-milling equipment, they create sugary delicacies and inform the public of the sugar cane industry and its processes. After being cut down for harvest, a sugarcane stalk will reshoot itself for up to five years. 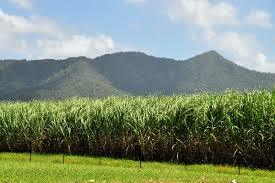 Then the farmer must plow the field and replant by burying six inch cuts of mature cane called billets. The cane grows into 2-4 meter stalks of tall grass and matures after 12-16 months. Harvesting is June through November and the seasonal vocation employs more than 16,000 people from growers and harvesters to millers and transporters. Upon being harvested, the cane is delivered to the mills within an astonishing 16 hours, via a 4,000 km network of narrow-gauge railway or via highway transport. Time is of the essence as the sugar begins evaporating almost immediately after being harvested. Arriving at the mill, it is chopped, shredded and crushed, separating the plant fiber, or bagasse, from the liquid sugar. Burning the bagasse to power the mills, sugarcane is the only crop in the world which provides its own fossil fuels. The excess fifty percent of the electricity produced during burning, is exported. The sugarcane juice is then clarified to remove soil and other impurities, boiled to remove excess water, and thickened into syrup. The liquid is seeded with tiny raw sugar crystals, causing the liquid to crystalize. The crystals are separated from the molasses using a centrifugal machine similar to the spin cycle in a clothes washer. The molasses, removed in the refining process, is bottled and sold, or used to make alcohol and ethanol. Other products created using the by products from sugar are: paper, plastic, pharmeceuticals, fuel and clothing, fertilizer for cane farms and gardens. After having our brains stuffed with knowledge at the Sarina Sugar Shed, the best was yet to come: samples! Sauces and chutneys, relishes and marinades. While the adults partook in several different types of alcoholic selections crafted at the facility, the kids enjoyed fairy floss (aka: cotton candy). Okay, so I opted for the fairy floss, too! Recently I have had tiny, fluttering moths in the boat. But these pantry moths are not so innocent. I had no idea this little one would be propagating in my pantry! It seems she bites a hole through even the toughest plastic bag, spins a cocoon and lets her young hatch and feed on the food in the bag. My food, now containing larvae and webbing, must be discarded. On another note, did you know that chicken eggs do not need refrigeration? If the eggs haven’t been washed or refrigerated, they will keep just fine on the kitchen counter. But watch out for that one egg on the bottom tray that has a crack. Flies will find it and deposit their young, causing a stench like none other. Ever smelled a rotten egg crawling with maggots? Yech! She is easy to find, prevent, and to get rid of. She sticks to one type of food which makes detecting her quite simple. But it is how she lays her eggs that is quite amazing. Less than six millimeters in length, this type of beetle is found worldwide. She gnaws a hole into a bag of pasta and enters easily. She lays her egg INSIDE the hard, dried pasta and seals up the hold with a gelatinous secretion. She can do this 6,000 times each year. You will notice broken pieces of pasta in the package and maybe see some adult weevils crawling around inside. Upon closer inspection, tiny black dots can be detected in whole pieces of pasta. The babies bore a hole out of the dried pasta and begin their life. Congratulations, you now have dinner guests. Carefully scanning each bag of pasta prior to purchase, arriving back at the boat, I immediately deposit all pasta bags into the freezer for their first two days aboard Stop Work Order. No weevils can survive the cold for that long. I have only experienced wheat weevils, but there are also weevils more prone to rye, corn, barley, oats or to rice. What a remarkable critter. I wonder who I will encounter on my next shopping trip. A disturbance in the surface of the ocean usually indicates some type of sea life, so the other day, when we spotted a massive upward spray about a kilometer behind us, imagine our excitement. What type of animal would have such a substantial spray? It must be huge! Often we will turn the boat around and carefully draw near one of God's amazing creations. This time, the spray was such a distance away, we first chose to use the binoculars. Upon closer inspection, there was a single canoe with a lone occupant near the sprays. It wasn’t a marine animal at all! We had heard much about this manner of fishing but had yet to witness it. These backyard bombers use a dangerous combination of chemicals, housed in pop bottles, to fish…the lazy man’s way. The destructive explosion causes underwater shockwaves, rupturing the swim bladders of fish and disabling their natural buoyancy. Twenty percent of the dead fish float and are gathered by the fishermen. Eighty percent sink and are never recovered. The coral reef is now a pile of wreckage and an inhospitable ecosystem. Surviving fish must move on. Hunger looms on the horizon for families who have to paddle further and further away to catch each meal. Premature detonations leave behind a wake of human injuries and casualties. Where do the chemicals come from? After World War II, a plethora of dynamite was left behind in the South Pacific and was free game. Another way is to simply purchase the ingredients from the local hardware store. Dynamite fishing is outlawed in many areas, but with thousands of islands, enforcement is next to impossible. Some communities are becoming educated and joining forces to eliminate the practice of dynamite fishing. A slow progression toward ingredient banning is a potential solution, but far from fixing the crisis. The widespread practice of dynamite fishing is said to be the principal destroyer of marine reefs which will require five to ten years to once again become a thriving residence to hundreds of species. Families have to move. Ecosystems are destroyed. People are injured. Food is wasted. How long will it take for people to realize the damage they are causing? Ever since the winds blew us into the Solomon Islands, we have been seeing people gnawing on something that makes their mouth and teeth crazy red. I have been asking a myriad of questions, and learning heaps about this peculiar addiction. Solomon Islanders call it Betelnut. Local Papua New Guineans call it Buai. Nonetheless, it has a huge presence, often occupying more tables at the local markets than fresh fruits and vegetables. A complicated process, involving three essential components to stimulate its effectiveness, you start with a nut from the Areca Palm tree. When the exterior is green, it is ripe. Ripping away the strawlike husk with your teeth, you discard it on the ground, wherever you are. Chewing a chunk of the innermost, white betelnut by itself delivers no euphoric or crimson results, but combined with the next ingredient, is a gamechanger. No, not the citrus fruit, as I originally thought, but lime made from cooking dead coral in an underground oven with hot rocks for seven hours. The melted coral is strained and the powder is stored and sold as the activating ingredient in your daily Betelnut snack. Bags of lime, resembling bags of cocaine, are sold at the market. Dipping your betelnut leaf or mustard stick (a growth on the mustard vine) into the lime and chewing it with the betelnut, activates the absorbtion into your body. Now you have bright red teeth, permanent red lipstick and copious amounts of saliva. Spitting becomes a regular habit and loosing your teeth no longer alarms you. Oh, and you may spit anywhere you please. My favorite is when a local bus comes to a stop, the door opens to let out a passenger, along with the other passengers' squirts of red liquid onto the sidewalk in front of me. In some areas, when it rains, the puddles are blood red from the scads of spittle on the ground. Wikipedia quotes the effect as no more than a strong cup of coffee, but witnessing some of the users, I beg to differ. My new Papua New Guinean friend Wendy, told me Buai is dubbed the "talking nut," making her talk a lot; Susan mentioned its title, "Papua New Guinea Whiskey" as it has similar effects as alcohol. It is legal to chew at any age and I have seen "pikinini's" as young as seven with bright red smiles. The only people groups still hosting sparkling white smiles are those committed to the local church. Chewing as many as 30 nuts each day, the men carry around woven satchels similar for their stash. My inclination is to stick with chewing gum. PS. My North American readers may find it interesting to know that historically, our Native Indians practiced a similar custom, using burned mollusk shells to heighten the effects of tobacco. Sweat trickles down my brow. Young girl and boy in dug out canoe. "Change?" says the girl, five years old. Change? What could she mean? Older boy in nearby canoe. "They want to exchange. Trade." Back to young pikinini, "What you likem change for?" Colors? Again, I am stuck. Older boy helps, "Pencil crayons." A few "colors," some pieces of paper, a couple candies, two balloons.